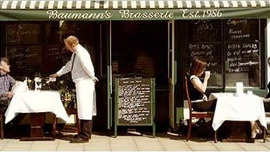 The name of the restaurant might have changed from Baumanns to Ranfield's Brasserie, but the new owner is Head Chef JB who has held the reins of the kitchen for the last seven years, and continues to earn awards and commendations for his cuisine. Set in the centre of Coggleshall in an attractive sixteenth century half-timbered building, the restaurant has been doing great business since it was set up in 1986 by the late Peter Langan (of Langan's Brasserie fame) together with his young head chef, Mark Baumann. An immensely likeable place, tables are dressed in fine napery and an eclectic collection of artwork adorns the walls. Service is notably attentive and knowledgeable whilst retaining a warmth and friendliness to proceedings. The kitchen employs high-quality ingredients for menus that change regularly with the seasons. Alongside superb A La Carte and Taster menus, they also offer lunches, Light Bites and and Afternoon Tea. Delivery a raft of tempting ideas ranging from house oak smoked venison, gooseberry splodge and champagne pickled pears to Kalonji Jhinga, dry fried large black tiger prawns marinated with yoghurt, paprika, ginger, garlic and nigella seeds amongst the starters. Main courses cover a lot of ground with Kangaroo skewers, dirty rice and hoi sin ponzu or maybe butter glazed supreme of brill, asparagus and samphire with crab bisque. To conclude there are tempting desserts such as raspberry and lime iced parfait and mojito sorbet or cinnamon rolled jam doughnuts, crème de leche and whipped cream. The wine list brings together some great wines from around the globe, featuring a collection that offers something for everyone in terms of both taste and budget.